One of the fun things that happen when two or three BigD members gather together for coffee or a meal is the phosphate binder ritual: all hands dip into pockets to find calcium pills, into the mouth, swallow with a sip of water and its back to the conversation. We all do it, but I know it took me a while to understand why. Just recently we had an in-house briefing about it at our dialysis unit from the very excellent Cath F, so I thought I’d share what was said. (The good stuff is hers, any mistakes are mine.) Thanks Cath. It is all to do with ensuring that our calcium levels remain high enough to keep our bones and muscles strong and healthy. I have often thought that my body is just a big bag of chemicals. If all the chemicals are in balance, I feel fine and can take on the world. If the chemicals are out of balance, I’m not worth talking to. In the case of calcium (and its evil brother phosphate), it is very much getting the mix right. In the normal course of events, we eat foods with calcium and phosphate (and many other things). The calcium and phosphate travel to our stomach, where the right amounts are absorbed into the bloodstream and the rest flushed away via the bowel. Guess which organs regulate the level of calcium and phosphate in the bloodstream? You got it, the kidneys (with the liver). They do this by producing a hormone called Calcitriol, or activated Vitamin D. Calcitriol also controls another organ group, the parathyroids, four glands the size of a grain of rice in the neck, surrounding the Adam’s apple. These control how much calcium is in our bones, and how much calcium is in our blood. But for BigD members, it’s a little different. Without the kidney producing the Calcitriol to control how much phosphate and calcium gets into the bloodstream, the gates are wide open. That’s when the evil brother takes over. All those extra phosphate molecules in the bloodstream attract and combine with the calcium, quickly causing a calcium shortage. 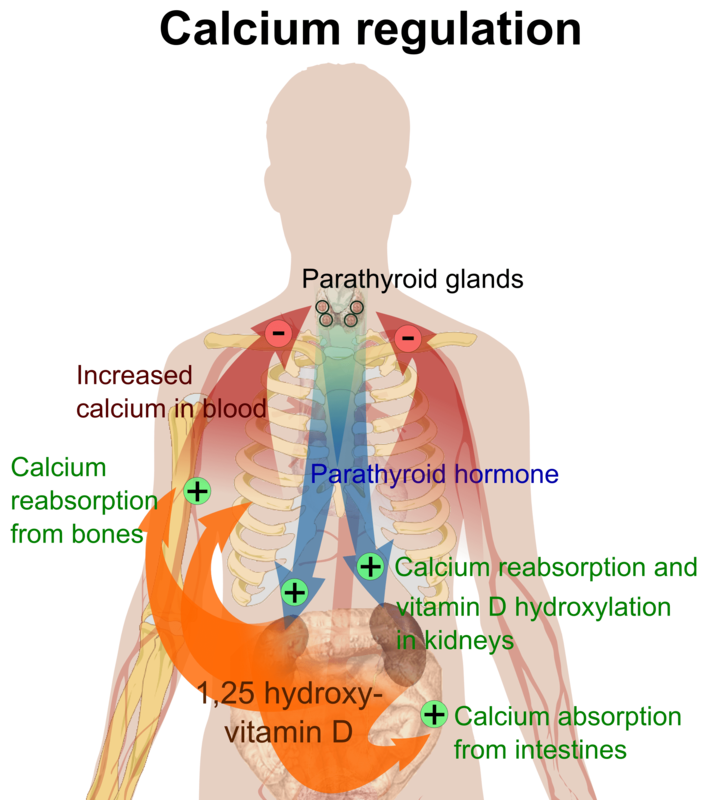 The parathyroids identify the shortage and instruct the body to release more calcium from our bones. The phosphate combines with that calcium too and the parathyroids calls for more calcium, and so on in a vicious cycle until our bones become porous and fragile. Bad news all around. There are several actions we can take to prevent this. Firstly, we can replace the Calcitriol that our kidneys no longer produce with artificial Calcitriol (in little red and white football-shaped pills) that performs the same function. The level required varies and most people have a regular blood test (typically monthly) to track and manage it. I take four every Thursday. The level sorts itself out over the week. Secondly, we can slow the operation of the parathyroids. These days this is done with a drug called Sensipar® (or Mimpara®), that mimics a high calcium level for the parathyroids. It stops them sending those “send more calcium” signals to our bones. Before this drug, we used to have a small surgical procedure to remove some or all the glands. I am in this “before” group. You can tell who we are: we all have a nice white line below our Adam’s apple (indicating that we are all members of the BigD Parathyroid Subcommittee). Thirdly and most commonly, we can take phosphate binders. These work pretty simply: you take at least one just before you have food or drink that has phosphate in it (just about everything has phosphate!). The pill sits in your stomach and unravels into liquid. As the phosphate-rich food arrives, it floats in the calcium liquid, and the phosphate binds with the calcium. The joint phosphate-calcium molecules are then carried through the gut, into the bowel and out into the cold hard world again. Pretty-well everyone’s monthly blood tests include phosphate levels, so it’s pretty easy to keep track. I take about two 600mg Caltrate (calcium carbonate) tablets and one 750mg Fosrenol (lanthanum) chewable tablet as phosphate binders before meals. Over the last few months mine have been stubbornly high, and I have the itches and aches to prove it. However I recently increased my Calcitriol dose and I think things are improving. The other technique of course is to cut the phosphate-rich food you put in your mouth. I made the mistake about 6 months ago of going onto Soymilk. I thought (without doing any research) that it must have lower phosphate than cow’s milk – seems logical, right? Every week I got itchier and every month my phosphate level got higher. I doubled my phosphate binders and it was still high. Finally I spoke to our unit’s dietician and she told me the awful truth: soymilk is VERY high in phosphate. And I was having a great dose on my cereal every morning! So I asked the obvious question: what should I be having? The answer surprised me: Rice milk – low in phosphate and quite tasty (though rice milk on rice bubbles seems a little one-dimensional). Still, the result has been impressive: my phosphate is nearly normal. So next time you get together for coffee, don’t forget the ritual. Do it early and do it often, and keep your bones healthy. Posted on May 29, 2011 by dialyblog •	This entry was posted in Bones and binders, Eat healthy, Healthy dialysis. Bookmark the permalink. Thanks for this clear information. Had never even heard of the parathyroidl. Back in dialysis after a 10-year holiday in transplant, I’m struggling with phosphate binding. Not to mention the potassium crisis when cheap, fantastic oranges hit Vancouver and I lost my mind. As part of my work on getting a handle on my situation, I’ve built a small collection of tools to track blood pressure, tests/results and observations, nutritional info and so on. BodyBus is free [donationware], and it’s already helped in my search for the best goal weight. Very interested in receiving honest feedback. BodyBus links to this blog in its resources section.